The recent passing of the oldest known survivor of the Holocaust, Alice Herz-Sommer, who has died aged 110, is the subject of Oscar-nominated film The Lady in Number 6. The character of this amazing woman never ceases to amaze anyone who came in contact with her. Alice had a forgiving heart, and her optimism saw her through hell during the holocaust. The book, ‘A Garden of Eden in Hell’ tells the story of Alice’s life, we were able to peep into the life of an optimist, a woman who famously said she bears no grudge, in spite of all she went through; losing her mother and husband in horrendous circumstances, Alice forgave, seeking succour through music and filling her days with love. Alice was born in 1903 in Prague, into a prosperous, cultured and musical Moravian family. Her mother had been a childhood friend of the composer Gustav Mahler, and Alice remembered the première of his second symphony when she was about eight. She also vividly recalled another family friend, “Uncle Franz”, the author Franz Kafka. Her talent was recognised when she was only five, and she had lessons with Conrad Ansorge, who had been a pupil of Franz Liszt (“as a pianist, extraordinary, as a teacher, not so good”, she told the Guardian). By her mid-teens she herself was teaching and touring as a pianist. She married her musician husband, Leopold Sommer, a fortnight after meeting him in 1931, and they had one son, Raphael, who became a concert cellist. In an interview with the Guardian a few years after she reluctantly gave up daily swims at the age of 97, she recalled that the three were allowed to stay on in their flat, with Nazi neighbours on every side, for some time after Hitler invaded Czechoslovakia and most of the Jews of Prague were sent to a ghetto. Then in 1943 the inevitable order came: they were sent to Theresienstadt. In another interview she recalled asking: “If they have an orchestra in Terezin, how bad can it be?” Despite being run as a show camp to impress visitors including the Red Cross, almost 35,000 prisoners died there, including her mother. Alice’s music saved her life: she became a member of the camp orchestra, and played in more than 150 concerts, including special performances for the Red Cross inspectors. Her husband died soon after being moved to Auschwitz and then Dachau in 1944, but her son, who also performed in children’s operas, was among 130 survivors of 15,000 children sent to the camp. After the war she lived for many years in Israel, teaching and performing, but moved to London in 1986 with her son and his family. He died in 2001 while on a concert tour, aged 65. Alice’s grandson, Ariel Sommer, said she died peacefully on Sunday morning – only two days after she was admitted to hospital – with her family by her bedside. Alice is survived by two grandsons, David and Ariel Sommer. 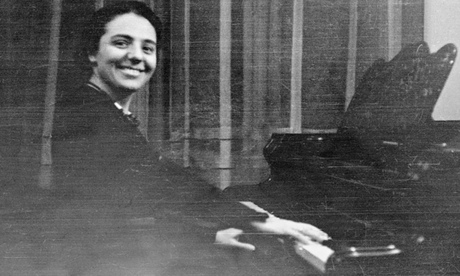 • Alice Herz-Sommer, pianist, born 26 November 1903; died 23 February 2014. Some parts of this article was originally written by Maev Kennedy of The Guardian. February 27, 2014 in Home. ← Learning To Write Is Learning To Live!